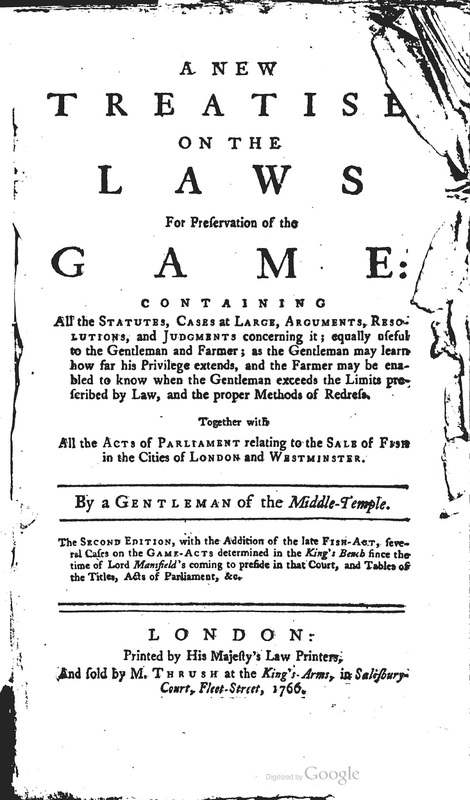 So (as Ann Wilson sang), the first post in the digital library of historical environmental law series is on A New Treatise on the Laws for Preservation of the Game, first published in 1764; the second edition, available online, was printed in London in 1766 by His Majesty's Law Printers. The title page gives the author as "a Gentleman of the Middle-Temple"; said gentleman was apparently one Timothy Cunningham, a prolific author of law books in eighteenth century Britain. The title of "Gentleman" may have been about more than manners or class, as the long title of the treatise has this explanation (Oklahoma!, anyone? ): "Containing All the Statutes, Cases at Large, Arguments, Resolutions and Judgments concerning it; equally useful to the Gentleman and Farmer; as the Gentleman may learn how far his Privilege extends, and the Farmer may be enabled to know when the Gentleman exceeds the Limits prescribed by Law, and the proper Methods of Redress." So the author must have been something of a "sporting gentleman" (as he puts it on in the "Advertisement") himself, not simply a disinterested scholar. There's lots more historical game and fish law in this treatise, but that's all for this week. If anyone knows what fyrets, hays, and so on are, please comment. This digital library project is fascinating and most welcome. And I'm delighted that you begin it with an item on wildlife law. The prohibition in the 1390 Game Law on the use of "fyrets, hays, nets, harepipes, cords, [or] other engines" was as much an effort at social control as it was an attempt to manage wildlife in medieval England. Conigries were rabbit warrens. Fyrets were ferrets. Hays were nets used to catch rabbits. And harepipes were snares (the making and deployment of which is even now the subject of a YouTube movie). The devices were used by poachers, whose assembly (covinage) on the edges of private lands, especially on Sundays when landowners were in church, was seen as a sign of potential social unrest. 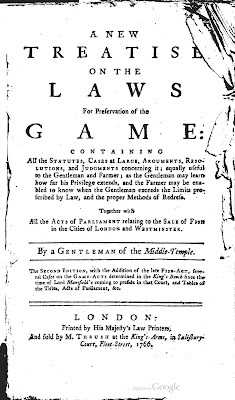 This Game Law, which spelled the end of commonalty hunting on unenclosed land in England, was one of the qualification statutes aimed at restricting hunting to certain social classes. In fact, its property restriction wasn't terribly exclusive and, after 1390, the law was almost never enforced, perhaps because poaching was an activity that all social classes enjoyed in medieval England. See also, Richard Almond, MEDIEVAL HUNTING (2003); William Perry Marvin, "Slaughter and Romance: Hunting Reserves in Late Medieval England," 224-252 in MEDIEVAL CRIME AND SOCIAL CONTROL (Barbara Hanawalt & David Wallace eds. 1999); William Perry Marvin, HUNTING LAW AND RITUAL IN MEDIEVAL ENGLISH LITERATURE (2006). Thanks for the explanations and the references!